For our Humanities exhibition our project was based around socialization. We dove deep, we discovered information and facts that even I though were strange. The facts were right, and amazing. When we were all ready to begin prototyping we all got together as a 9th grade and voted. We together decided by a very large majority, we would like to do our exhibition resembling maze or "haunted house". We all built and designed this "maze". The other part is that we all made masks. Each of us made a mask that we thought resembled us, and how we were socialized, or about socialization itself. We used plastic to protect us from plaster of pairs strips that covered our face. The hardest part personally was holding straws in my mouth while someone plastered my face. I plastered that mask, put in long hours of work refining it at home, project application and in humanities work time. I ended up with this piece. On the right of my mask is some of the social media sites that usually have a negative or positive affects on one's socialization. Facebook is at the top, because you may post pictures and some people are just plane rude i.e "you should workout more", "get a better life", and "that person is not fit", all harmful words. Facebook could also be good i.e "you look good", "that's a pretty place", "We should hangout" "keep up the good work". Snap chat is in the middle because you can message anyone and they can message you back, saying rude, mean or bad comets on your appearance or what you should to to improve your life. They are like the "life police". they could also be good i.e "hey, looking good", "have a nice day", or just a conversation. Pinterest is at the bottom because it is not as harmful as the other two, but it still causes harm, its way of harm is advertisement. it advertises how men and women should look, in every way. Pinterest advertises what they thing we should see each other, socialization folks. Now the right side of my mask is what this project did to me. 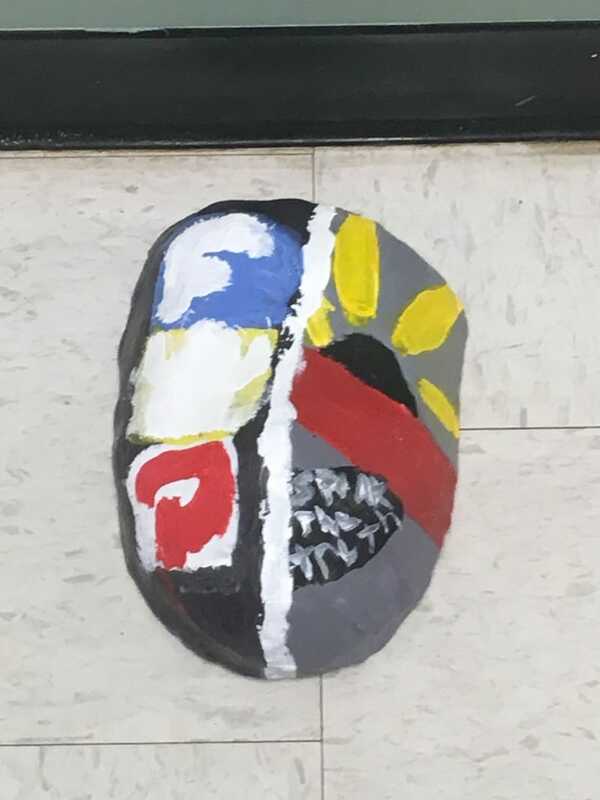 the meaning of the red blindfold is that this mask really opened up my eyes, but the fact that the eye is black and "light" going into the eye shows that so much information on socialization can be a lot to handle, but can be done. the smile with the words in it is "Speak the truth". something my mom always said to me, those three words has really shaped me and socialized me. Almost as much as my essay "moment in time".